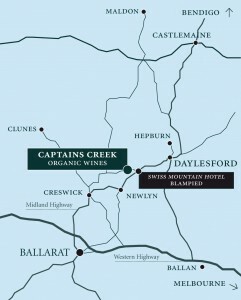 Captains Creek Organic Wines is located on Kangaroo Hills Rd in Blampied, VIC (between Ballarat and Daylesford). If you are arriving via the Midland Highway, turn off at the Swiss Mountain Hotel and then follow the posted signs. The Cellar Door & Café is open from 11am-5pm on Saturdays & Sundays. For bookings and enquiries, please call 5345 7408. If making an enquiry about functions, please review this page first. Additionally, you can complete the contact form below. For more information about Captains Creek vegie boxes, or to enrol in the vegie box scheme, visit this site. Follow Captains Creek Organic Wines on Facebook.